Photo: The H160 will serve as base for the future HIL light joint helicopter of the French military. 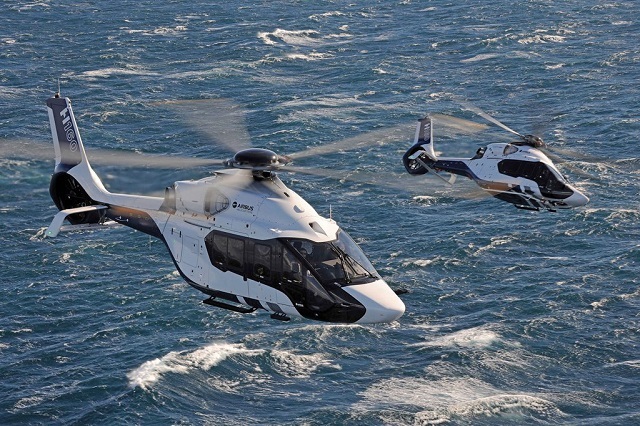 Picture: Airbus Helicopters. Perhaps it is not too early to start thinking about a replacement for the H-65s, after all the current design was selected in 1979, and they entered service 32 years ago. I’ve heard nothing about a plan to select a replacement, but NavyRecognition reports the French Navy has just selected the replacement for their counterparts to our MH-65s as well as a number of other helicopters, the AirBus H160 (more info here and here). In fact the H160 will replace six helicopter types used by French Armed Forces with the first expected to be delivered to the French Navy in 2024. The AirBus H160 is a lineal descendant of the AS365 which was the basis of the H-65. We have to think at least ten years ahead. Maybe we need a 30 year aviation assets plan. This entry was posted in aircraft, Budget, helicopter by Chuck Hill. Bookmark the permalink. Would the Lakota be a possible replacement? It probably is not made for a salt water environment either. The Lakota also has skid landing gear rather than wheels, which may be more difficult to move around the deck. Neither these or the the H160 are qualified for icing conditions. Shouldn’t we have some shipboard capable helos that are?